Did you ever see those little boxes of pills that come on blister cards? The box is a small carton with the company logo on the front and a couple of sheets of blister packed pills inside. This is another type of packaging that is also done at high speed and on the machine you see above. 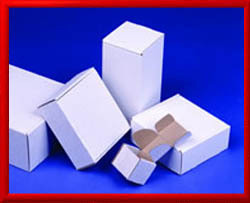 The little box is special in that it is called a die cut carton. From one sheet of card stock they use a specially manufactured die cut knife, which has a blade with a profile that is shaped exactly like the entire carton with all sides, unfolded. First the logo is printed on the card stock. Then the die cut knife cuts it out. After that the extreme sides of the cartons are glued together to form a unit ready to be erected. These are shipped flat in a stack to the end user. They are loaded as a stack into a feed magazine on the automatic cartooning machine. A vacuum suction cup mounted on a pick off arm pulls the cartons of the bottom of the stack one at a time. As it does so the guide rails start to cause the carton as it descends to unfold from the form of a thin trapezoid into a full rectangle and then deposit it into the horizontal carton transport chain. Tuckers and closer fingers close the back end of the carton as the cartoning chain moves horizontally. Then the carton arrives at the product insertion section at which point pusher fingers start to push the blister cards into the carton as they travel with the carton chain. Once the product is inserted tuckers and closers seal that end of the carton and it is ejected off the end of the machine. These machines can operate at the rate of hundreds of cartons per minute. The slide show has some more photos and sketches that show how these machines work. This particular machine proved to be a test as to how well can I design new control systems under pressure. This machine was bound for Africa. The letter of credit was going to expire in a few days. The control system was made up of groups of Boolean logic modules made by ABB that were ganged together. This system stopped working and there was no time to buy new ones from Germany. The customer was buying this machine to do one job only. I asked my boss to show me the size carton they were going to run. I then ripped out the entire ABB electric system and designed a newer simpler system using just a few relays to do the job. The machine tested OK and landed on the dock before the letter of credit expired. Computron strikes again!